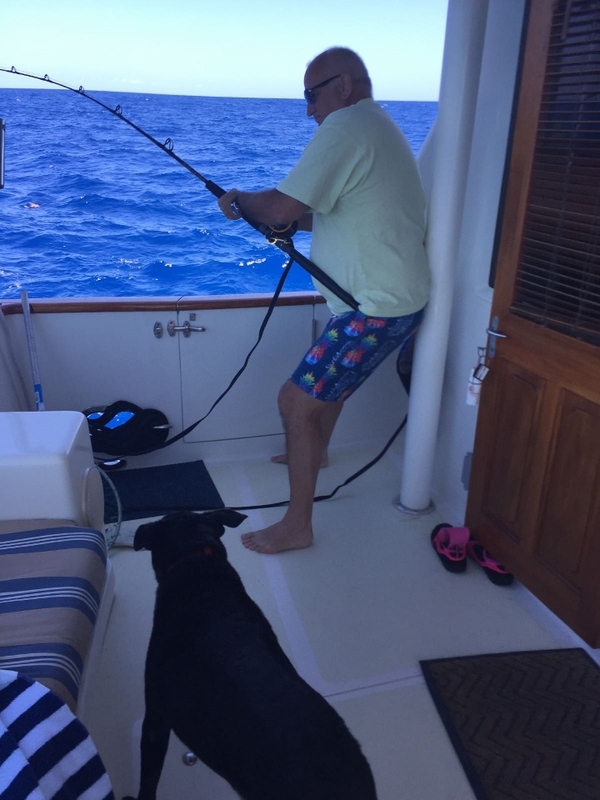 The World’s Best Boat Dog! 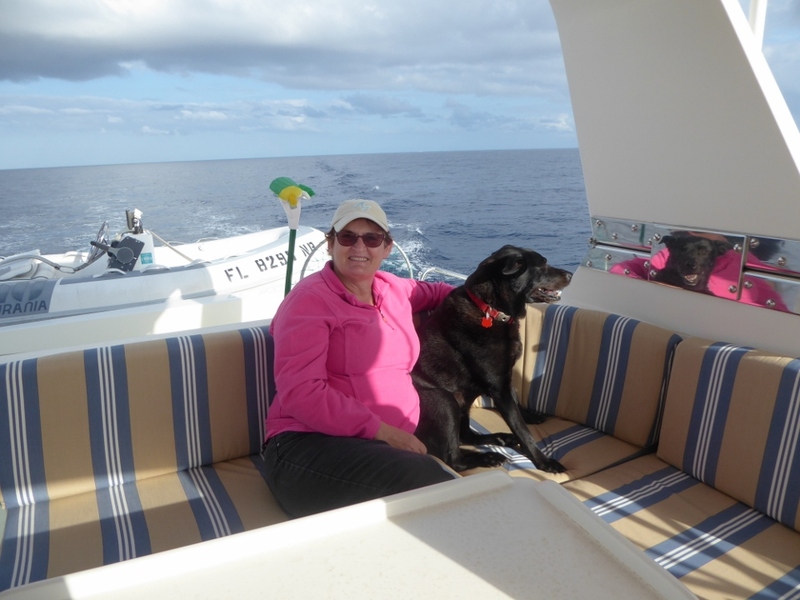 It’s All about Miss Grace – what it’s like cruising with an elderly dog. We are travelling with The World’s Best Dog, Grace. She is a lab mix, rescued by our daughter who vowed to do all the work and then promptly left home for college! She is nearly thirteen years old. Last September our vet told us that Grace was a very poorly dog with weeks, not months, to live. With that bombshell we opted to do no further medical investigation, just enjoy what precious time there was left. When we first envisioned this trip It was always our intention to bring Grace with us, but after getting the bad news we set about planning for it with the expectation that she would not be around when we set off in March. Grace however was not listening to the vet’s prognosis and like an Ever-Ready battery, and with a steroid every other day, she keeps on going, albeit at a slower pace. Our planning then changed to bringing her with us – but also included what our options were should she die mid-trip. We will not discuss those horrible options here as we are in the final two weeks of our trip and all is well (touch wood!). Her favorite spot- watching through the hawser hole! 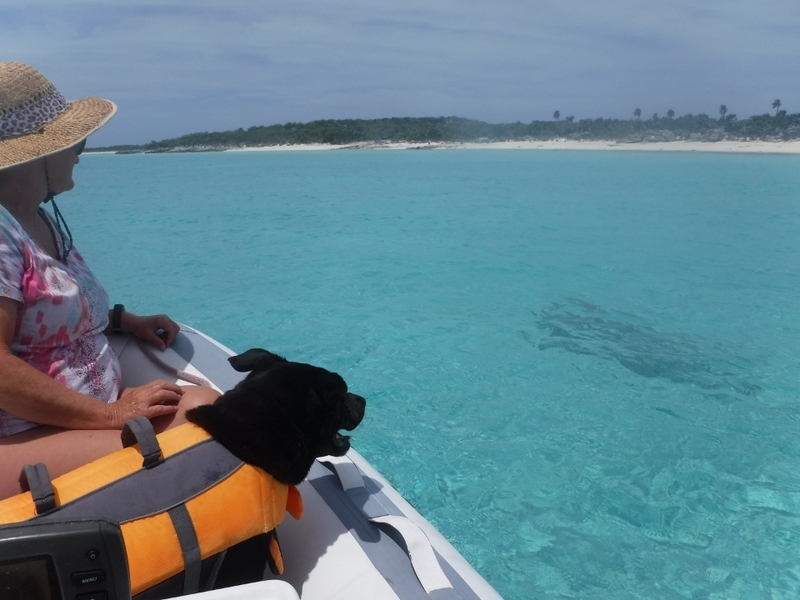 So what is it like travelling on a boat with an aging dog? Helping with my foredeck yoga! Our anchorages are chosen with Grace in mind, is there a beach close to hand? Does it look suitable for the dinghy? 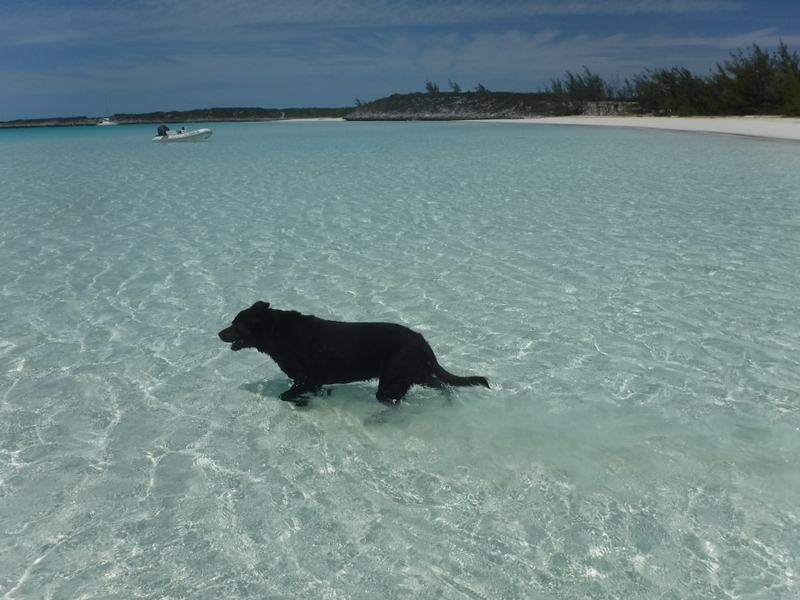 Three times a day, and after checking for other dogs, we troop into shore, no matter what the weather. Mostly we have been very fortunate, occasionally not. 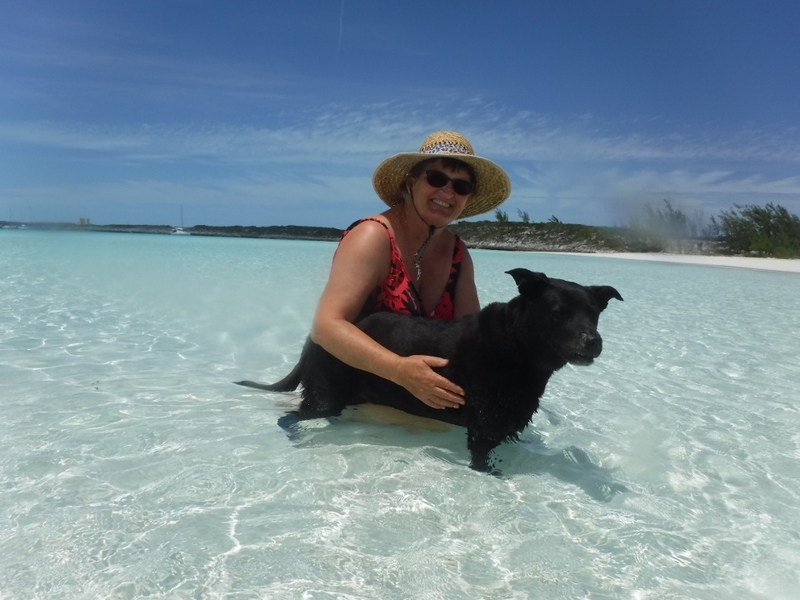 Getting an elderly dog into a rocking dinghy is a challenge. We invested in a doggy life jacket with handles, mostly so we can lift her in and out. Often people ask me about the life jacket, I tell them it’s for my benefit more than hers. Once on the shore it did not take Madam but a minute to realize the high water mark was a great place to find smelly things to eat. Resulting in her eating the remains of a bird and then an episode of vomiting and with blood in her urine many miles away from a vet. Luckily she survived but on shore we watch her closely and chase her away from the yucky stuff. As diligent dog owners we leave the beach clean and bury poop under bushes or trees and away from where children might play, using a garden trowel that we brought along specifically for that purpose, and quickly before the flies swarm. Protecting us against a nurse shark! One thing we have noticed, for the first time in her life, Grace needs her nails clipped. Three months of only sandy beaches has left her with talons! We hear her clip-clopping on the deck and I think she finds these nails uncomfortable. I didn’t expect or prepare to clip her nails and improvising with a sandpaper just didn’t work! We will wait to get home for a day at the doggie spa! 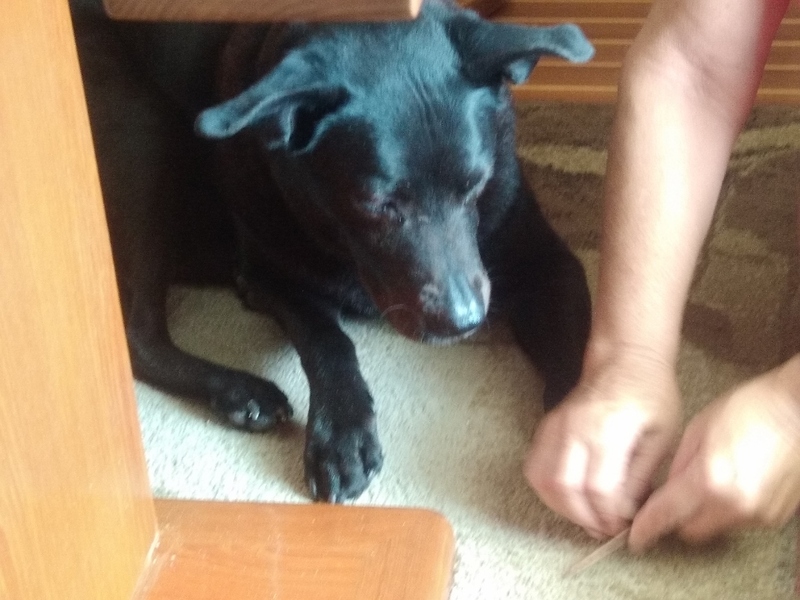 Sand papering her nails – she wasn’t overly happy about that! 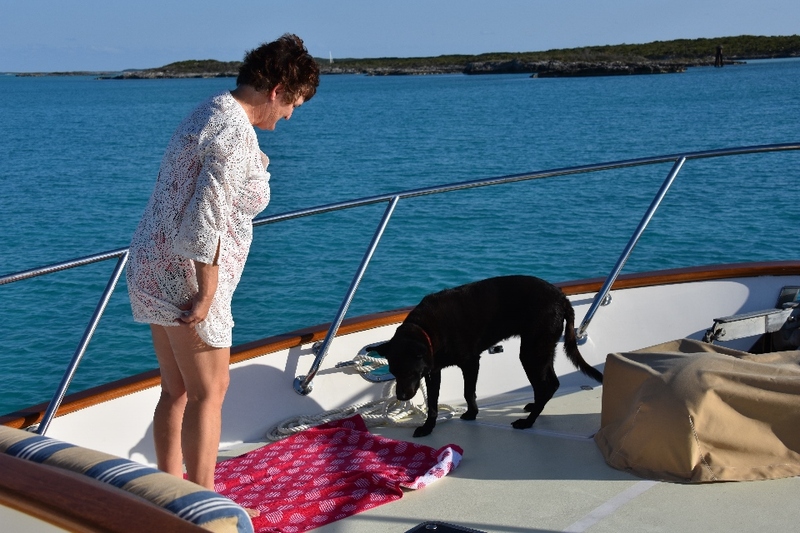 Grace has taken to living on the boat and revels in the close quarters with her human pack, so much so that she believes she should never be left behind. And is very vocal in her objection to that happening! Sometimes in a quiet anchorage we have to take her with us on unsuitable dinghy rides just so our neighbors can have peace. 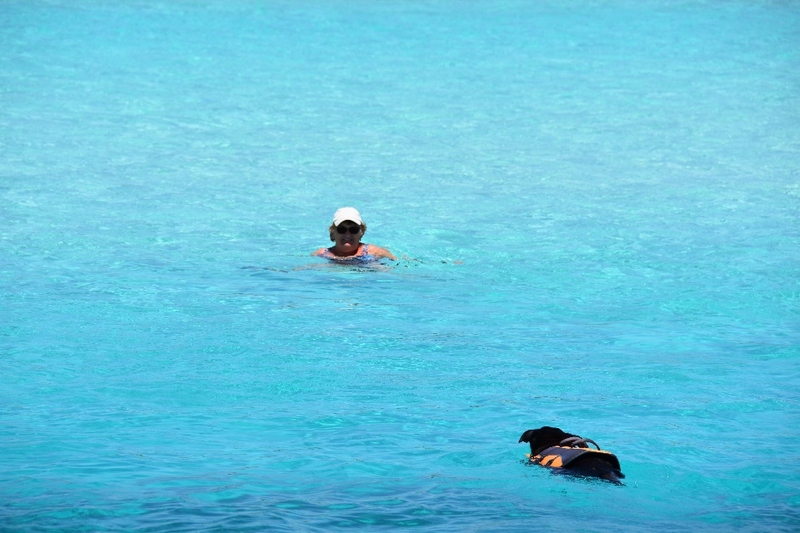 For example she came on the long ride with us to the Rocky Dundas cays where we snorkeled in caves. We had to anchor in deep water with no available beach and she had to sit in the boat, with just a short dunk in the sea to keep her cool. Thank goodness we do not have to worry about her jumping in! As far as she is concerned, as much as she didn’t enjoy the trip, anything is better than being left behind! 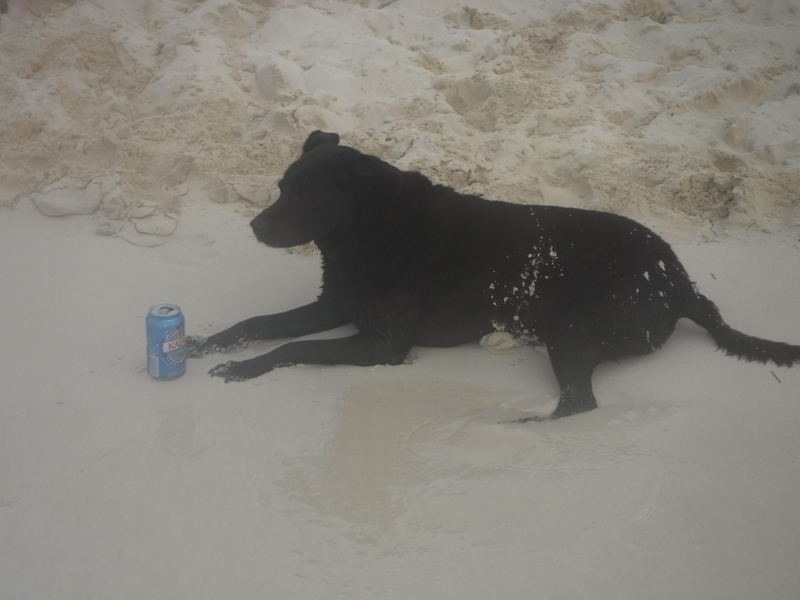 Guarding her master’s Kalik beer! 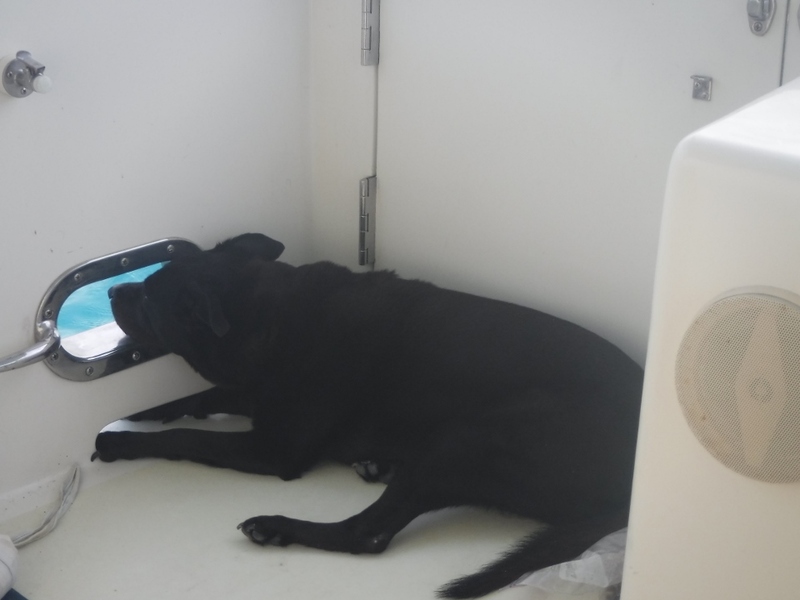 When it comes time for meal prep Grace can be found lying on the floor in the galley, in the most inconvenient spot there is. Not a crumb does she miss! We have all become adept at stepping over her! She accompanies me for most of my chores, and is a vigilant supervisor when we lift or lower the anchor. As stairs have become a struggle we have a routine when we are underway. 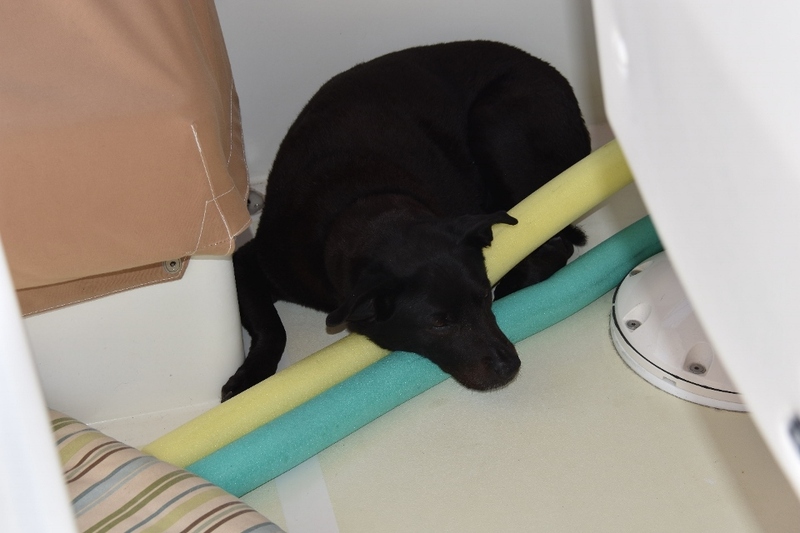 Once the anchor is secure I help her up to the flybridge where she tucks herself in the corner to ride out the swells. I close the door to the steps and if we are up there she stays put. A broken leg at this stage would be a significant problem for us all. 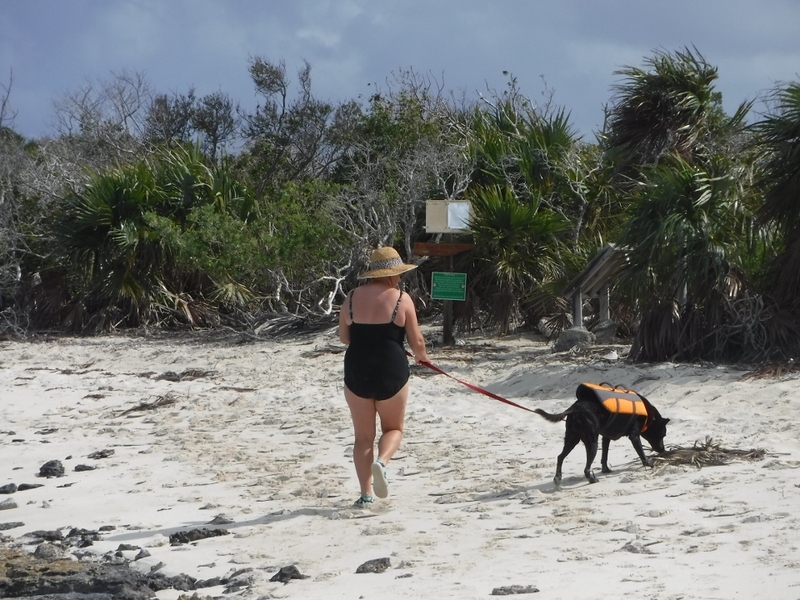 On our walks along the beach Grace can usually be spotted at our heels and I love the gentle pace of these walks. She paddles to cool down and swims which I presume feels good to her aging joints. Seeing how happy she is on the beach you cannot doubt she is loving life regardless. What a retirement she is having! A different use for water noodles! I have absolutely loved having Grace with us on this trip and could not have left her behind. 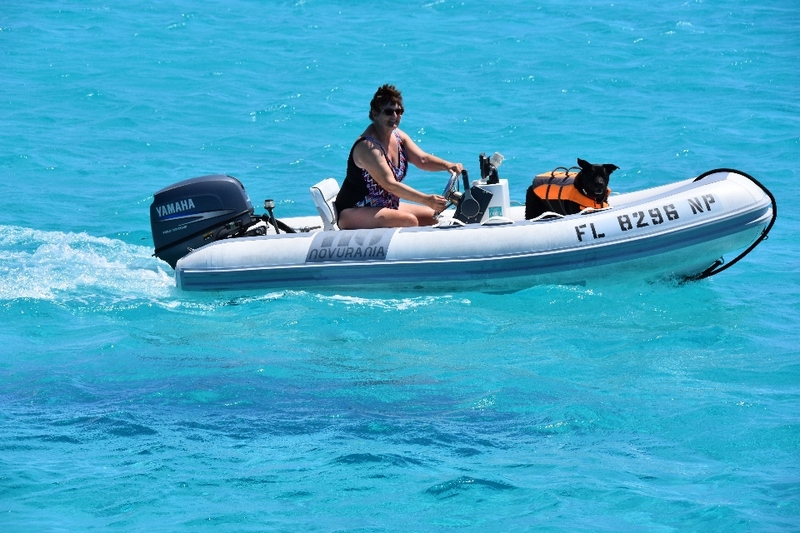 However if you are thinking of cruising with a four legged friend do not kid yourself, it adds to the work load, and does affect your cruising plans. Previous PostNorthern Exumas And Back To GeorgetownNext PostFirst Damage! A dog makes a boat a home. Fair winds and following seas Gracie. Love the shot of her looking at you in the reflection of the stainless hardware. Awww! She is great company, I think Annemarie has fallen for her! Gives a whole new dimension to “living a dog’s life”! Bless you all.